Avogadro’s law is a specific version of the ideal gas law. It says equal volumes at equal temperatures of an ideal gas all have the same number of molecules. This Avogadro’s law example problem will show how to use Avogadro’s law to find the number of moles in a given volume or the volume of a given number of moles. Three balloons filled with different amounts of an ideal gas. Question: Three balloons are filled with different amounts of an ideal gas. 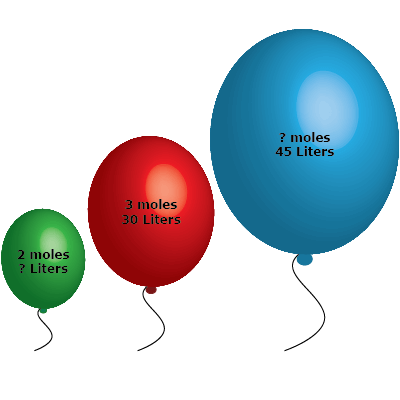 One balloon is filled with 3 moles of the ideal gas, filling the balloon to 30 L.
a) One balloon contains 2 moles of gas. What is the volume of the balloon? b) One balloon encloses a volume of 45 L. How many moles of gas are in the balloon? Avogadro’s law says the volume (V) is directly proportional to the number of molecules of gas (n) at the same temperature. This means the ratio of n to V is equal to a constant value. Since this constant never changes, the ratio will always be true for different amounts of gas and volumes. You would expect less gas to take up a smaller volume. In this case, 2 moles of gas only took up 20 L.
Use the same known values as in part a, but use 45 L for Vf. The larger volume means there is more gas in the balloon. In this case, there are 4.5 moles of the ideal gas in the larger balloon. An alternative method would be to use the ratio of the known values. In part a, the known values were the number of moles. There was second balloon had 2⁄3 the number of moles so it should have 2⁄3 of the volume and our final answer is 2⁄3 the known volume. The same is true of part b. The final volume is 1.5 times larger so it should have 1.5 times as many molecules. 1.5 x 3 = 4.5 which matches our answer. This is a great way to check your work. interpreted in terms of MOLES, MASS, and GAS VOLUMES at rtp. but VOLUMES of GASES don’t have to be equal because they vary with MOLES, which also don’t have to be equal.